In a blender, combine the 7 sauce ingredients, blend until very smooth, and set aside. Set a large skillet over medium heat and add olive oil. Add the onion and cook about 3 minutes. Add the bell pepper and sauté another 3 minutes. Turn the heat down to medium-low and layer the potatoes on top of the onion and bell pepper mixture. Add a few tablespoons of the cilantro chile sauce and season with salt and pepper. Cook about 5-7 minutes, stirring occacionally. 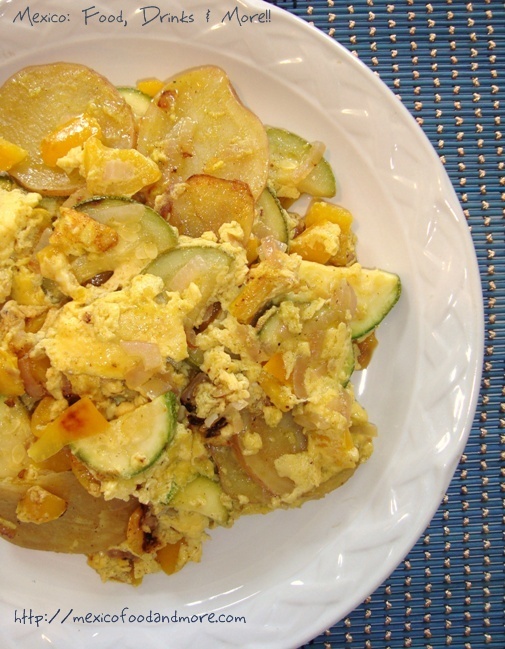 Place the zucchini in a single layer on top of the potatoes and add adittional salt and pepper as desired. continue to cook until the potatoes are tender. 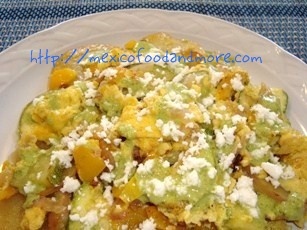 Turn the heat down to low and pour the eggs into the skillet. When the eggs have set up a bit, run a spatula around the edges of the skillet while tilting it so the uncooked egg will run to the underside and cook. 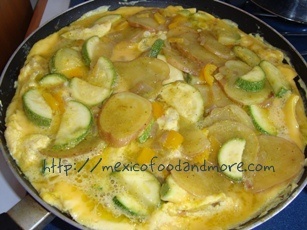 Add additional sauce and cover the frittata a few minutes to finish cooking. This entry is filed under Breakfast. You can follow any responses to this entry through the RSS 2.0 feed. You can leave a response, or trackback from your own site. I think I’ve tried one time at a party….